1. Compact design, fully enclosed body, very low noise. 2. Tool carrier adopts shear principle to decrease motor's load. High-Cr steel cutter together with strong high-speed motor as so to break various plastic object easily. 3. Adjustable material inlet in order to feed by conveying belt easily. 4. Shock-proof pad installed in order to absorb vibration while breaking. 5. Overload protection device for motor and chain protection device for power source to double protect the safety of motor and workers. 6. 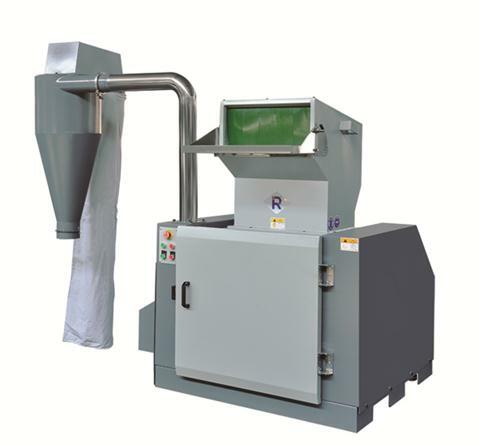 Equipped with cyclone dust-collector to separate dust efficiently. 7. Special-designed blower conveying system with powerful conveying capacity. Material doesn't go through blower, so it is good for both blower and material. 8. Suitable for breaking various plastic objects including film and bottles.